“Good going,” I thought, right after careening into a seven foot tower of a man. However as my eyes desperately searched for the room’s exit, a woman came around the corner, followed by two men, followed by another woman. It’s not just the toilets that are remarkable. 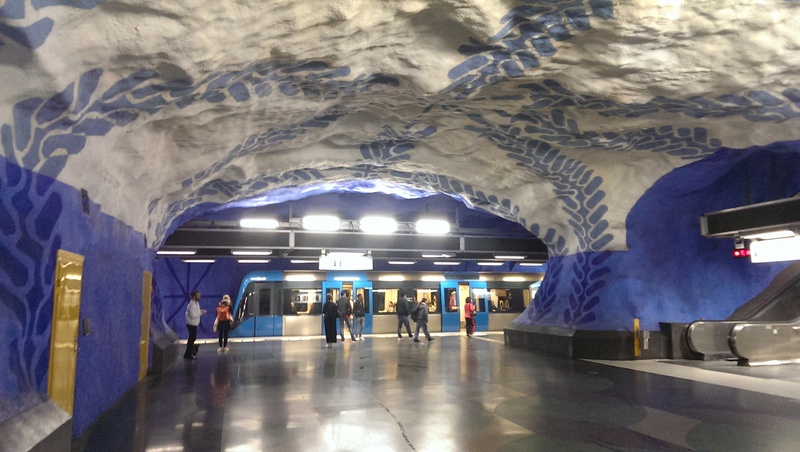 One of Stockholm’s subway lines retains the original, unrefined bedrock. Station stops feel like stunning Neanderthal art museums. Segregated bathrooms were the exception on my short Swedish excursion. Rubbing elbows with menfolk in the loo took some getting used to, but illuminated just how deeply divisive “normal” bathroom policies are. In this light, Sweden is transgender public porcelain paradise. Scrub-a-Dub – The other common public toilet feature? A private sink in every stall, in addition to an external wall of sinks and mirrors. Maybe Swedes are extra, extra clean? I dare you to guess the country in which this photo was taken! Sweden is Minnesota. Minnesota is Sweden. Whatever. 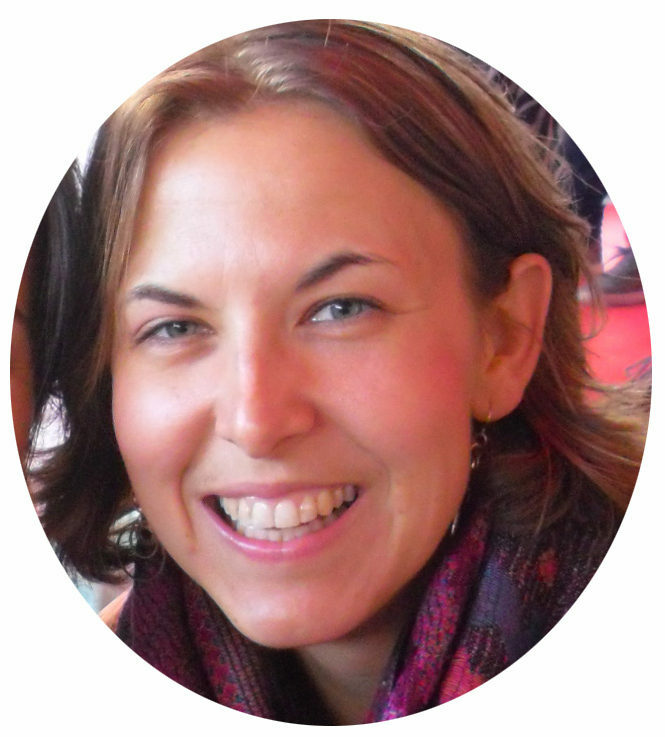 Our wonderful, wonderful couchsurfing host, Ida, lived out in Stockholm’s wooded suburbs. Walking down her streets sent my brain into a deja-vu tailspin. I suddenly, viscerally, understood Minnesota. The architecture, the colors, the lot layouts… everything screamed Minnesota. Stockholm is located on the edge of an archipelago, making it the land of 10,000 islands instead of the land of 10,000 lakes. Just like the home of the Vikings Football Team, it’s friggin freezing in the every season but summer. The leaves change color and drop off the trees in the fall. Swedes, who speak perfect English thanks to a policy of subtitling (vs. dubbing) foreign entertainment, even have the same accent as Minnesotans. Errr… I guess Minnesotans have the same accent as Swedes? Anyhoo… Mind. Blowing. One of the many plazas where a good fika can be had. 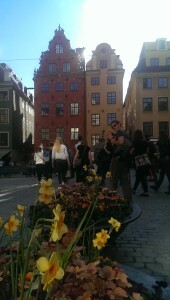 Fika Fun – every late-afternoon you can walk down an urban street and see the social practice of Fika in action. A hot beverage, and more importantly a sugary treat, are par for the course… with a major helping of chitchat. I’m told most everyone, Fikas – even at work. And why not? Few desk jockeys will claim mid-afternoon as a genuinely productive part of the workday. Gone Gangsta – From bus drivers to soccer moms to bankers, everyone sounds like a cross between a surfer dude and a classic thug. The Swedish way to say “hello” is “hey hey.” Step up to purchase some veggies and the cashier will say, “Hey hey.” Smile at the bus driver and they will “hey hey” you. Approach an info desk? “Hey hey.” – I grappled with cognitive dissonance as representatives of a rather formal culture consistently addressed me in a way my culture would label informal. Passionately Polite – Personal space is said to be King in Sweden. So what’s Queen? Waiting your turn. Line jumping/queue cutting inspires shock and disdain. It’s really bad. Swedes so value the importance of taking turns that they are said, when given a choice of two lines, to always choose the longer line lest they accidentally arrive at the point of action sooner than a person who has been waiting before them. I mulled over a fair chunk of the latter observations with the wonderful Ida – part actress, part-substitute teacher, part-couchsurfing host, all awesome. Thanks to the mid-May sunshine lasting from 3 a.m. to 11 p.m., we really struggled not to keep her up late chatting after our fantastic dinners in her adorable, pocket-size apartment. Her neighborhood trails, woods, sunshine, and workout parks were an additional blessing. We also went on two “free” city tours – a style catching on internationally where at the conclusion you give according to what you think you got. Some guides manage to pull this off without seeming entitled or socially awkward, while others talk themselves right out of their wage. Liquor is controlled by the state in Sweden. Stock up on Friday or face a booze-free weekend! Hey – guess where else liquor is state controlled. Starts with an M, ends with innesota! Quietly Industrious – Swedes invent some of the world’s most used and loved things. #endlesswinter However, unlike some self-proud nations I’ve encountered, they don’t seek showers of praise. Of course you know about IKEA. (Ih-kea, not EYE-kea.) But H&M, the “Forever 21” of Europe? Swedish. Skype, i.e. the first free, international, visual connection? Swedish. Spotify – the queen of all music lovers’ hearts these days? Swedish. Those Nobel Prizes? Swedish. Alfred Nobel started his prize program to rectify his reputation as anything-BUT-peaceful. He had bags of money to give thanks to his love of explosions. He figured out mixing nitroglycerin and dirt could make some pretty rad bombs and was paid a pretty penny for his findings. When his brother died, the public mistook the death as Alfred’s. He was horrified to see obituaries describing him as a “man of death,” remembered not for genius but destruction. He immediately started a foundation to reflect his preference for peace, rewarding those who do well for humanity. This little figurine features on several tours a day. 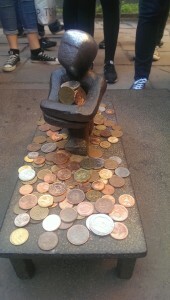 Surely the “wish” coins left there go to help the needy? Welcome Impostors – The Swedish royalty are… dark-haired. And dark-eyed. And… French. Yup. Not Swedish. Why? Well, long ago some Swedish ruler failed and the Swedes went looking for a good leader. They picked a French dude whose descendants are still living in the palace and representing the country to this day. Otherworldly Political Pull – one deceased prime minister is affecting legislation from the grave. His unsolved assassination in the 80’s remains a mystery on par with the conspiracy theories surrounding JFK’s fatal bullet wound. The statute of limitations on all crimes has been extended purely so that the killer, if every identified, can still be brought to justice. If you feel like some detective work, a seven million dollar paycheck waits at the end of the closed-case. High-Dollar Living – awesomeness comes with a hefty price tag. Wages are good in Sweden, the social system is amazing, and costs of goods is sky high. I thought Australia was bad, but Sweden takes the cake. Americans are inculcated to revile high prices, but maybe expensive material goods are a small trade off if they are part of a system that promotes a happy, balanced, secure life with plenty of vacation and time with your kids, hey? Reunited at last. Lucky to have met this kindred spirit! 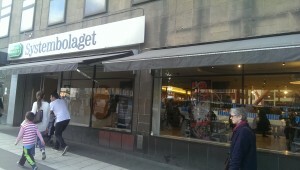 The final highlight of our accidental Swedish vacation? A friend reunion! Nelienne and I met in the Philippines, bonding over a new shared group of friends, island adventures, and a sudden travel emergency that started the moment we’d gotten as far off the beaten track as possible. 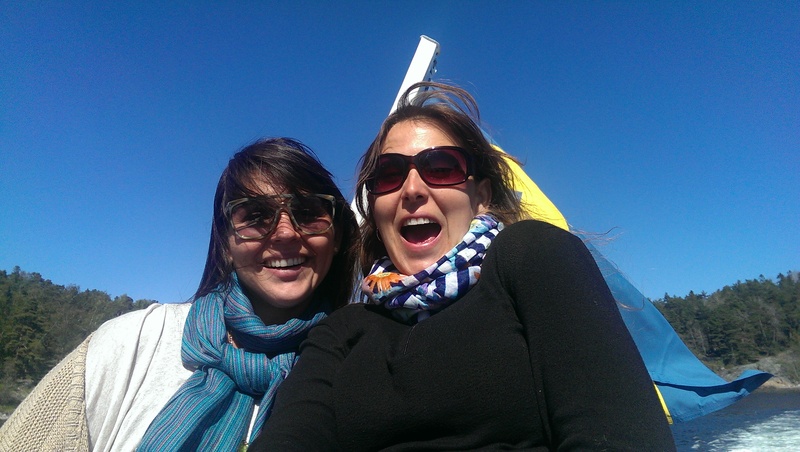 Kindred spirits both full of wanderlust and independence, we’ve kept in touch over the years via Skype and Facebook. Three and a half trips around the sun, and finally we could toast each other with a good glass of red wine. Our catch up involved an AirBnB rental in Midsommarvägen, a boat trip to Sandham way out in the archipelago, fun home-made dinners, Fika chats over cappuccinos, and catching up on regular weekend R&R. So. Refreshing. For great tips on things to do in Stockholm, check out travel blogger Julie Bazar’s action-packed, long weekend in the city. 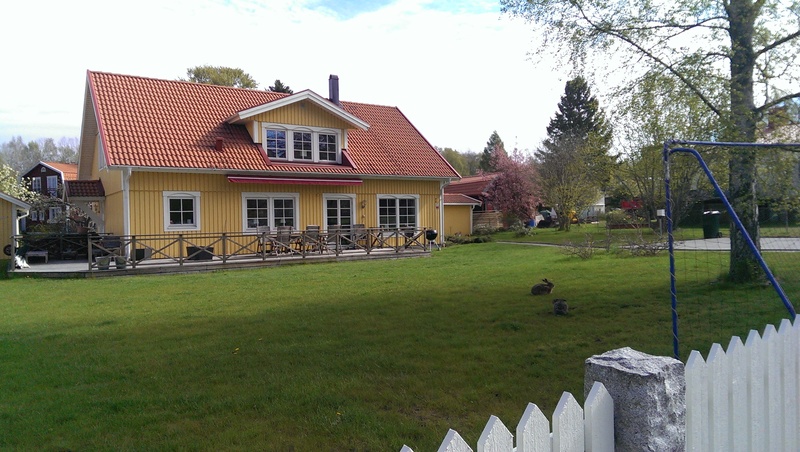 See where sailors get their mail, why you’d probably also eat “weinernougat”, and fall vicariously in love with springtime tulips in my Sweden photo album. Learn how you, too, can score insanely cheap flights with my Cheap Flight Hacks. « « Bullfighting Outlawed in Spain – Really!